The Clippers survived without Blake Griffin, but they need their superstar in order to advance in the NBA playoffs. Get all of Rob Mahoney's columns as soon as they’re published. Download the new Sports Illustrated app (iOS or Android) and personalize your experience by following your favorite teams and SI writers. For many teams around the NBA, what remains of the regular season is a formality. Their seeding may change but not their station. The bulk of the schedule has already largely cast and confirmed the league’s contenders, also-rans, and washouts, save for a precious few with the lingering potential to navigate between groups. The Los Angeles Clippers, even while functionally locked into the West’s No. 4 seed, count among those more fluid teams. Blake Griffin is slated to make his long–anticipated return this week after a foolish punch in December fractured his right hand and cost him four games in suspension. A partial tear in Griffin’s quad extended his absence. That he’ll return with games still to play in the regular season makes every remaining minute on the Clippers’ schedule precious. To this point, Clippers coach Doc Rivers has characterized each game without Griffin as its own, self–standing challenge. That approach helped L.A. cobble together a 29–14 record in Griffin’s absence, though at this point some attention ought be paid to the Clipper star’s staging. 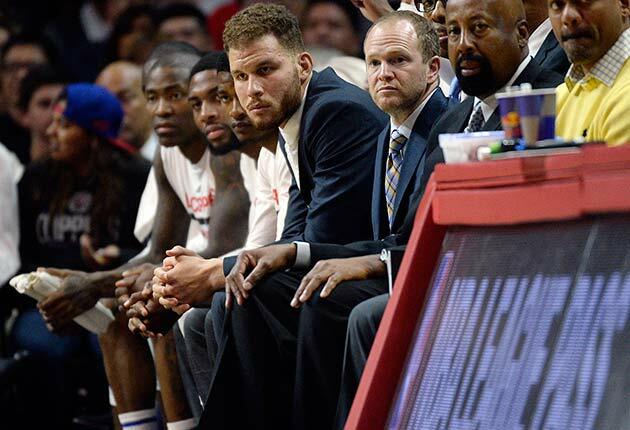 It’s been more than three months—and 43 games—since Griffin played a minute for the Clippers. Rivers should begin to shape his rotation with Griffin in mind, if only to reacclimate his team to its typical rhythms of substitution. Griffin will likely need time to get up to game speed. The Clippers, too, will have to adjust to his presence—one worlds different in function from Luc Richard Mbah a Moute, Paul Pierce, or Jeff Green. Pierce’s hideous fall on Monday night complicates matters, even as his initial diagnosis (a mere ankle sprain) alleviates the Clippers’ deeper fears. Pierce is in no way the caliber of contributor that Griffin is, but both are essential as the Clippers push their playoff limits. There is a course forward in which L.A. is simply grist for the mill—a generic opponent that must be dispatched en route to a Warriors–Spurs Western Conference final. Alternatively, there is a path in which a dominant power forward blends seamlessly back into a team that learned plenty in his absence. Debating whether the Clippers have any real chance of challenging the Warriors in the second round of the playoffs really runs secondary to the fact that Griffin will need to play well and Pierce will need to fill minutes if they’re to have any chance at all. C​hris Paul has shown, through Griffin’s absence, how much weight his skill level still carries in maintaining an NBA offense. DeAndre Jordan has augmented the Clippers’ spacing with his rolls to the rim, buoyed the team’s rebounding, and propped up its defense. J.J. Redick found balance as an All-Star–level contributor, generating much–needed scoring opportunities with movement and guile. Those three, with the help of a cast of role players, lifted the Clippers to respectability over the back half of the season. It’s best that term comes to its end. While L.A.’s survival without Griffin has engendered some healthy reconsideration of the Clippers’ construction, this is a team best understood in the context of playoff necessity. So long as the Clippers’ success is a function of how much the team's stars can bear, they’ll be destined to flame out against the deeper, more balanced contenders at the top of the conference. Griffin’s production lifts the Clippers, but it’s his versatility that transforms them. His ball–handling relieves Paul from the possession–to–possession grind of playoff defense. His rebounding helps to complete defensive possessions and punish opposing small–ball lineups. His work as a passer makes optimal use of the Clipper role players and talents as a scorer keeps the offense humming. The only way for a team like the Clippers to adapt in the face of smart, concerted counters is through a player like Griffin—one whose wealth of ability can help the team to redirect as needed. Green, who has yet to play with Griffin, may have said it best (via the Los Angeles Times): "With the team that we're going to have, we’re going to have a lot of options." Options win playoff series. Those ousted from the postseason do so upon having their options extinguished, primarily by opponents who have keyed in on their flaws. These Clippers would be doomed to that very fate if not for Griffin—unsettled not by having their success exposed as smoke and mirrors but by the diminishing returns of their Paul-dominant style. Griffin, if nothing else, offers a path that might diversify the Clippers’ offense and bolster its rotation just enough to make things interesting. Every minute Griffin plays the rest of the way comes in service of that goal.